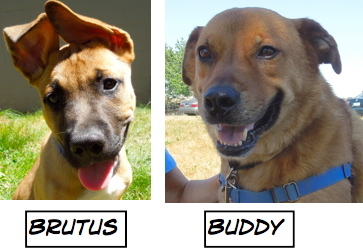 This Week’s Featured Adoptable Dogs @ Willamette Humane Society by Martha Russell | Adopt An Oregon Dog! 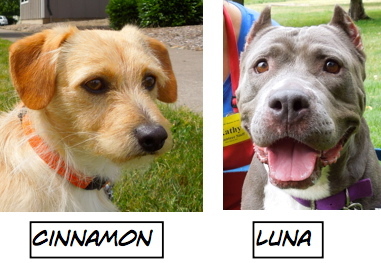 It’s been a GREAT week for dog adoptions! 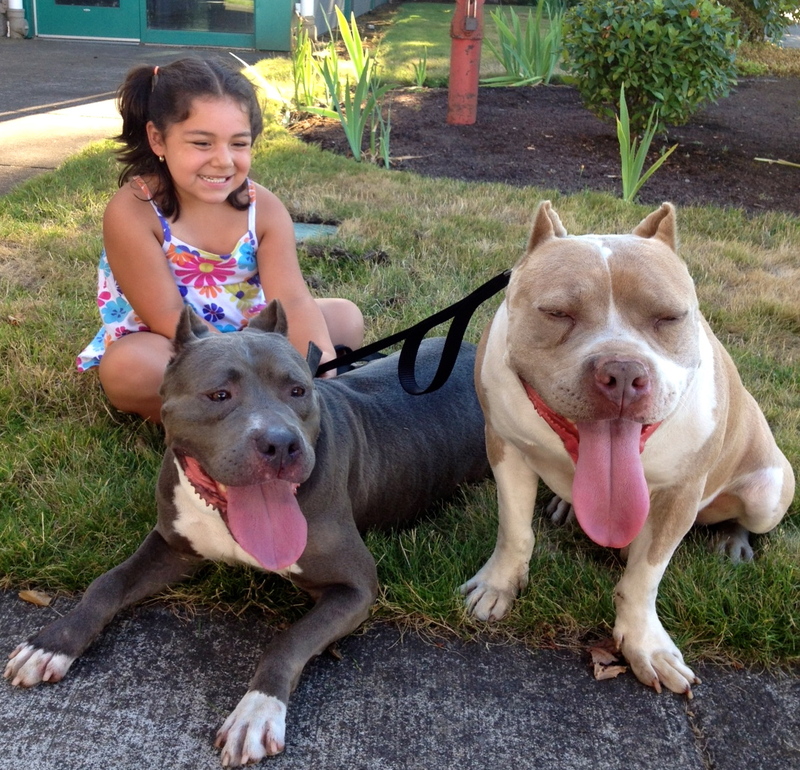 Check out these great happy Blog Dog beginnings! 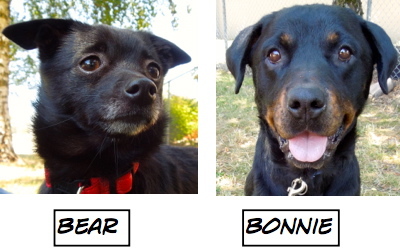 As I always do when I get to meet adopters, I gave them my card and asked them to send me an update when they could. Much to my delight that very evening they sent these pictures of Luna’s first family outing. They said she was settling in perfectly and they were all so happy. I’m sure you will agree! 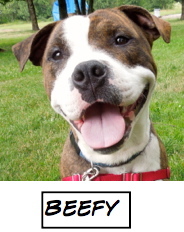 Beefy (Remington) goes home, too! Here’s another wonderful adoption! Beefy had been at WHS since June 10. He’s got one of the biggest smiles I’ve ever seen. He finally found his perfect match with Adam. Here they were on Sunday. What a happy pair! 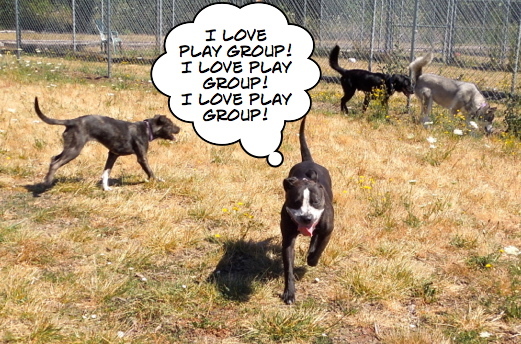 Sunday was the perfect summer morning for play group. 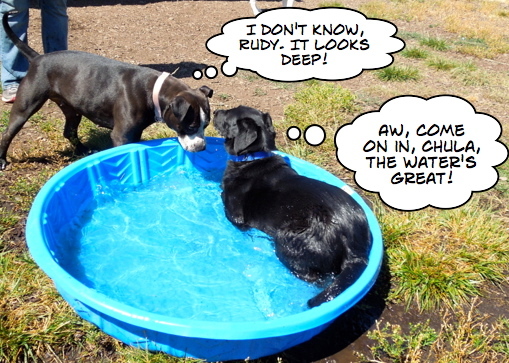 Everyone had a great time and the pool was very popular. Here’s what I overheard. 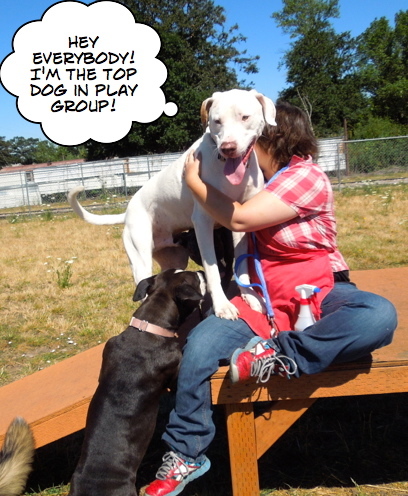 This was Chula’s first time in play group and she had a blast. 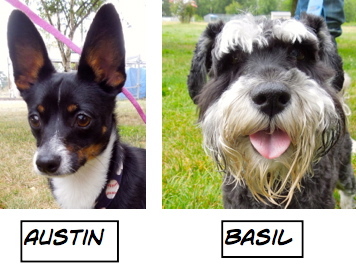 Several of the camp dogs were adopted right after camp finished last Thursday afternoon. 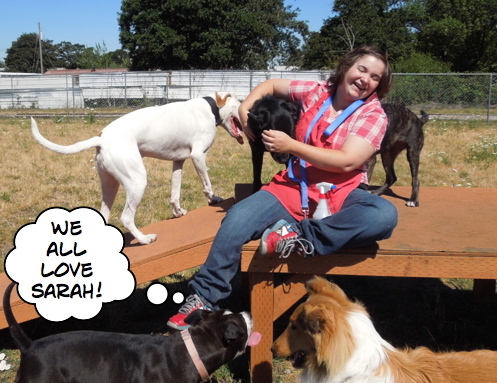 Dylan hopes she will be next! 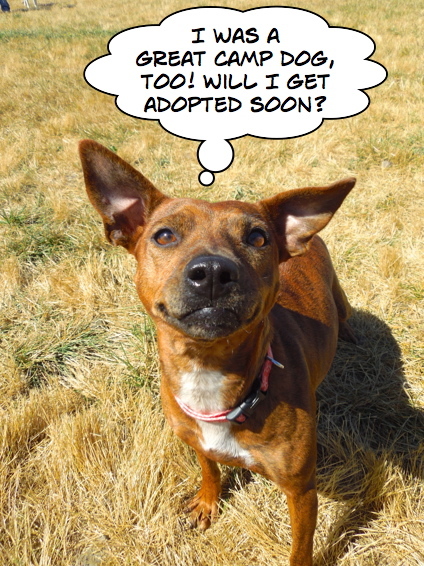 She is a two-year-old Terrier mix. 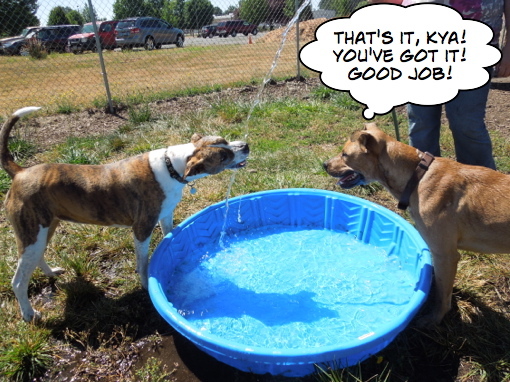 Kya is volunteer Sherrie’s dog. Jax has developed a huge crush on her and the two of them played the whole time. I’m a Love Bug! Looking for me? 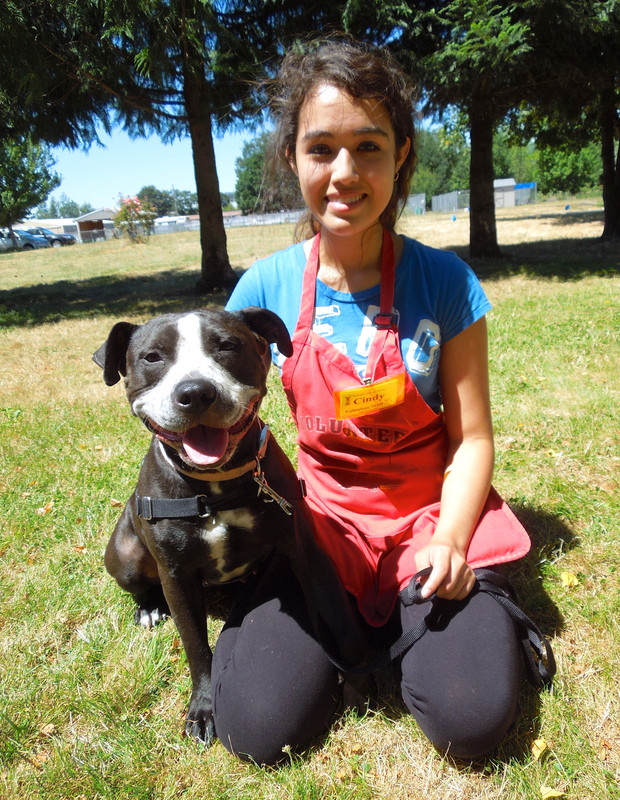 Meet ever-happy Chula, a two-year-old Pit Bull Terrier mix who is such an endearing little girl. She is affectionate and loves to have her tummy rubbed (see second photo). She had a wonderful time in play group on Sunday as you saw in the cartoons. She loves treats and took them from me gently. 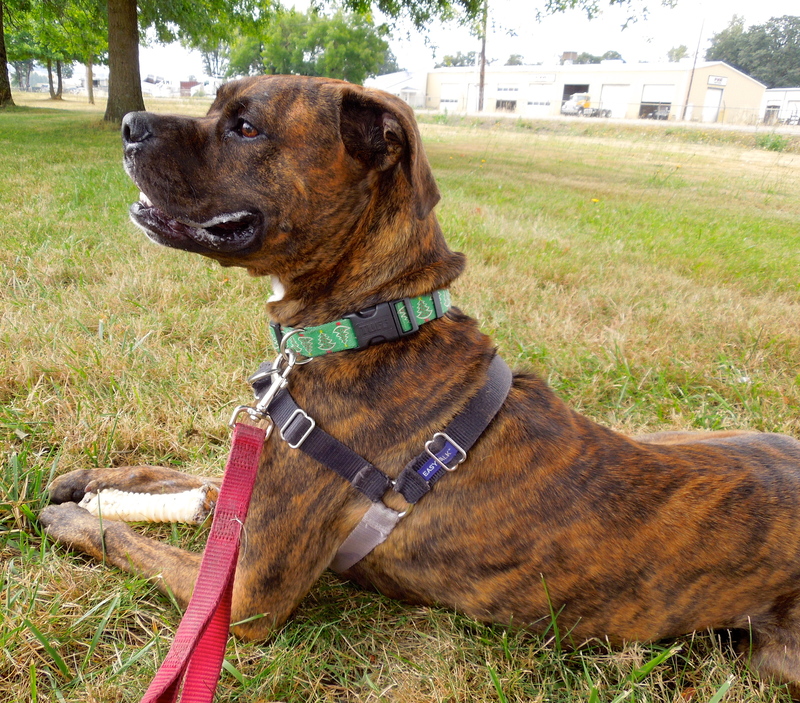 She knows a few commands and since she is treat-motivated, would do great in one of our WHS training classes where she would shine. 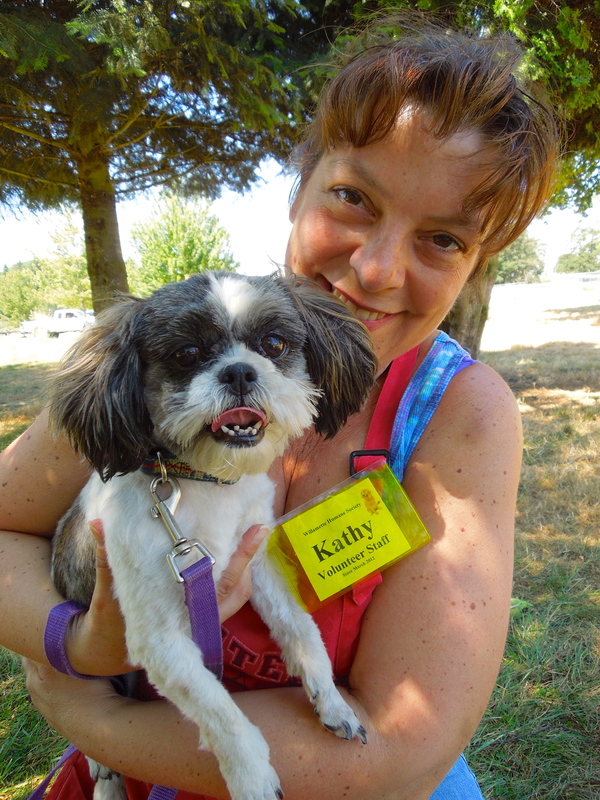 Here she is with volunteer Cindy. What? You have a cat you say? No problem! 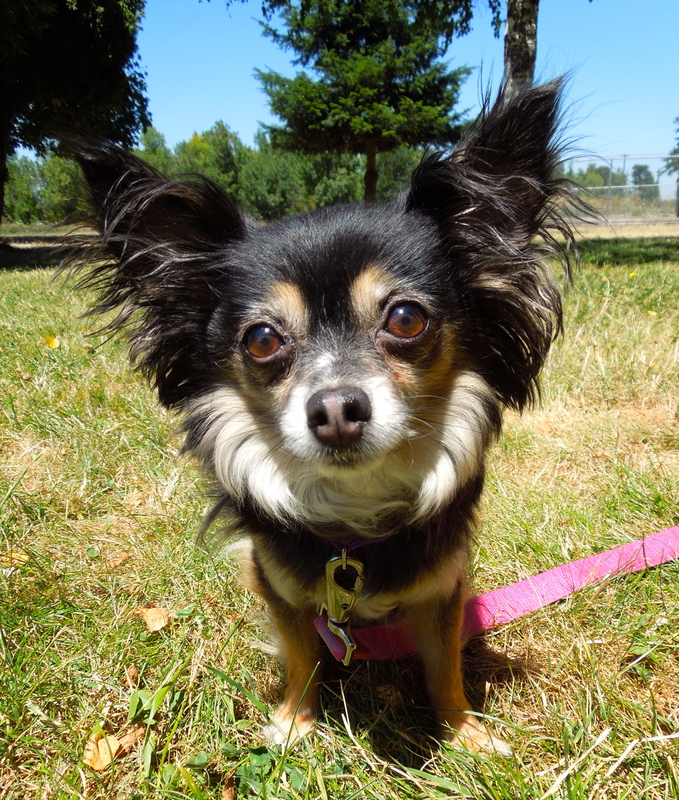 Meet Sedona, a ten-year-old Chihuahua mix, who though is shy at first, warms up quickly and loves to sit in your lap. She would like to be the only dog in your life, but has lived successfully with cats and children as long as they respect her small size. 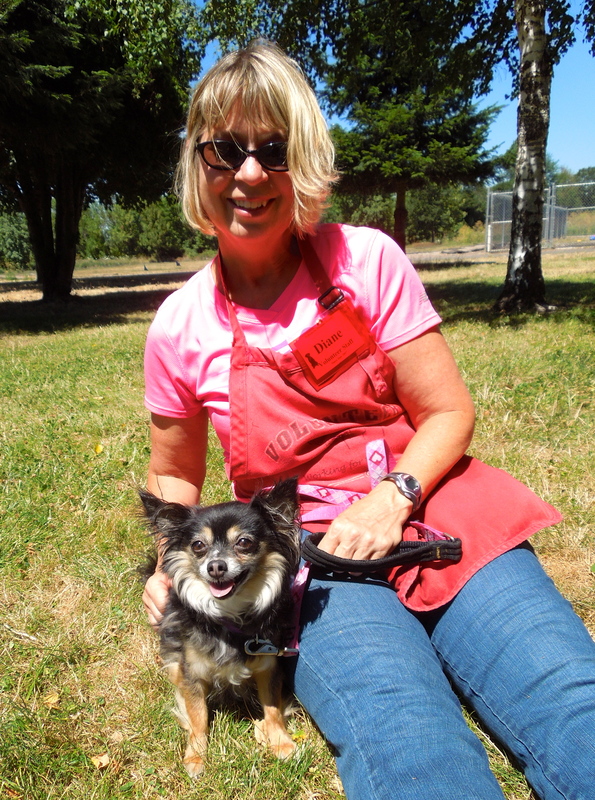 Volunteer Diane fell in love with this little character on Sunday. 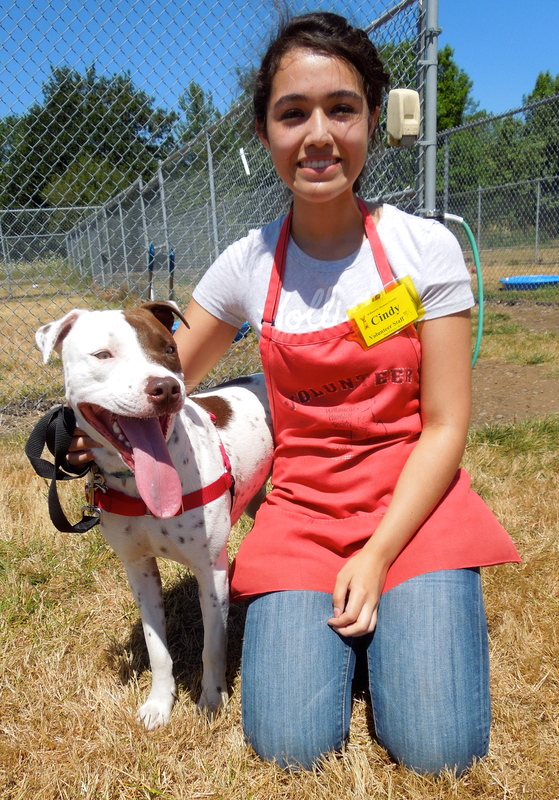 I’m new here and staff and volunteers are falling for me already! 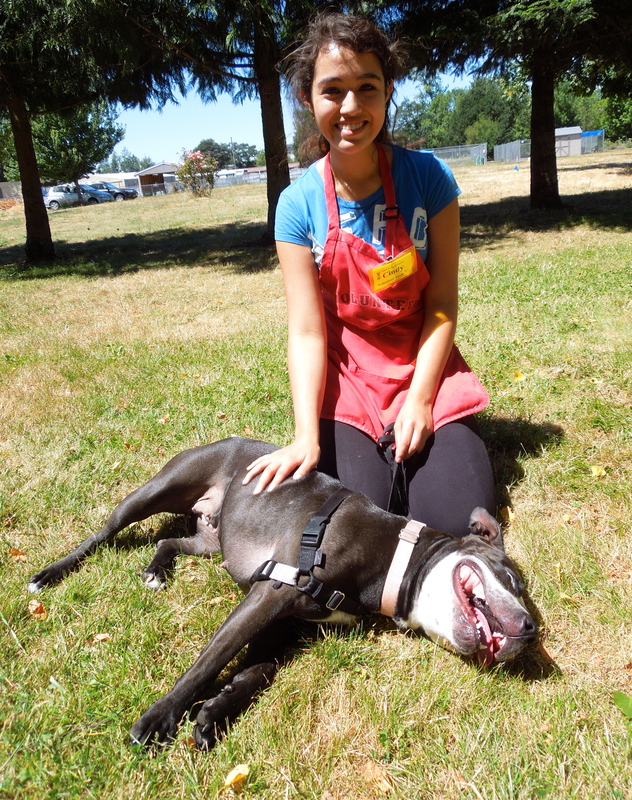 When volunteer Francis came out with Magic for her afternoon Sunday walk, he couldn’t tell me enough good things about her. 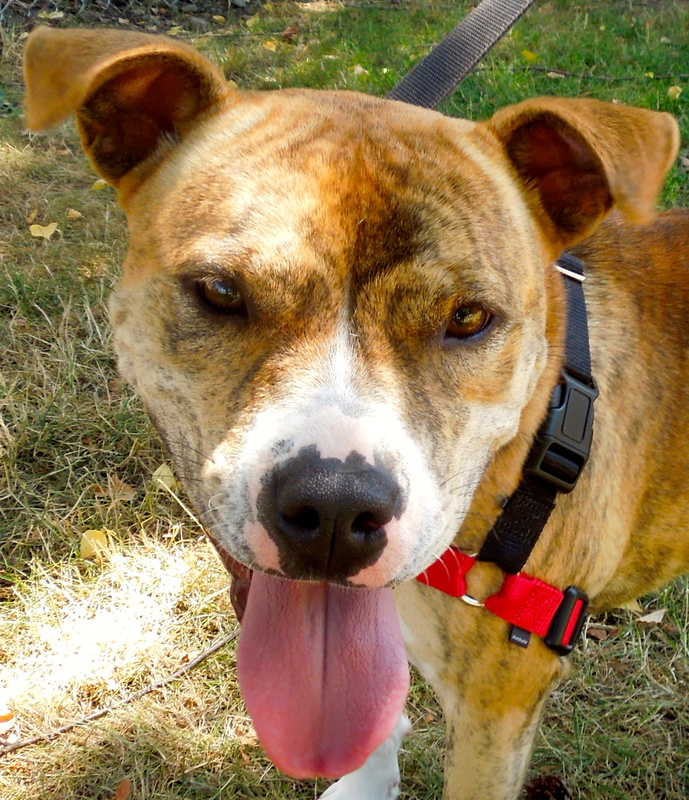 She is calm, she walks well on leash, is affectionate, likes other dogs, and takes treats politely. In short, she’s a wonderful dog. 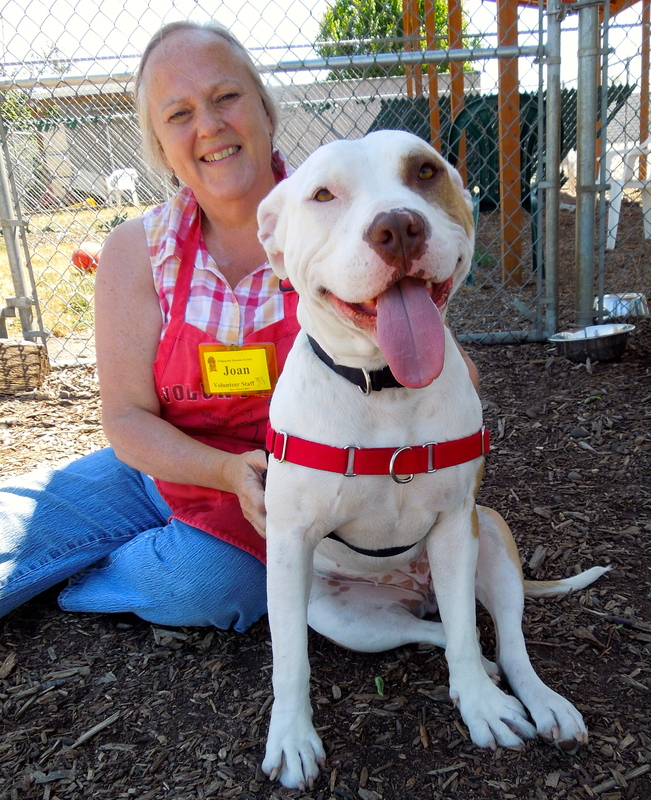 She’s an eight-month-old Pit Bull Terrier mix waiting for her new people. They will be very lucky! 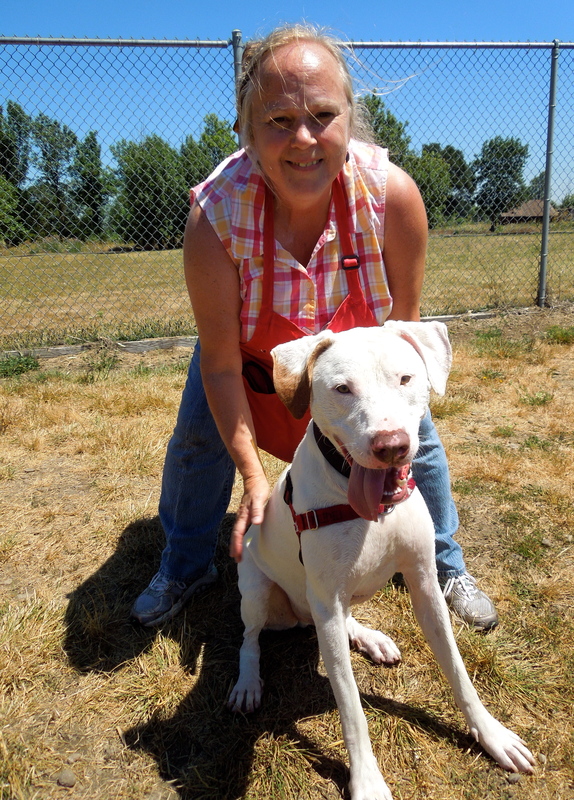 Here is Magic today with volunteer Joan. 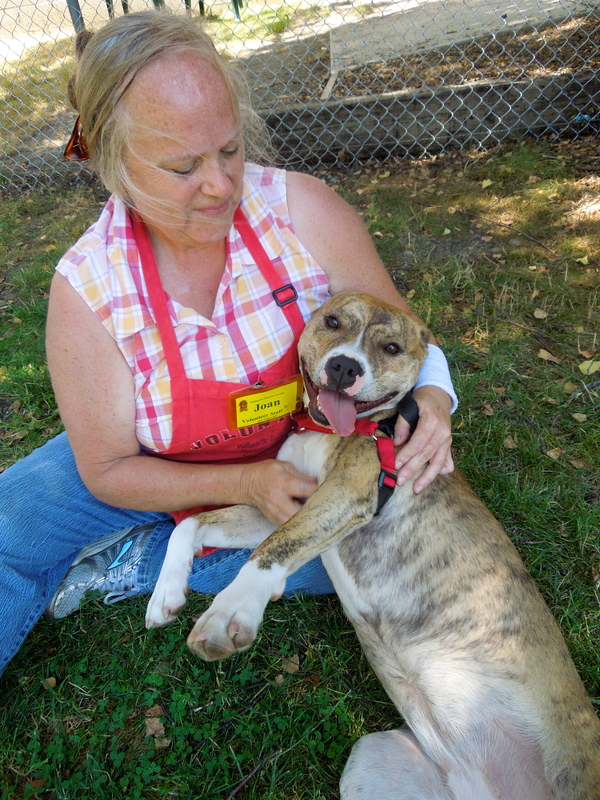 Yep, another volunteer falls for this sweetheart. We’re puppies. We’re awfully cute! I don’t usually feature puppies because they get adopted quickly, however, as I was walking past the kennels on Sunday, I couldn’t help but snap these pictures. 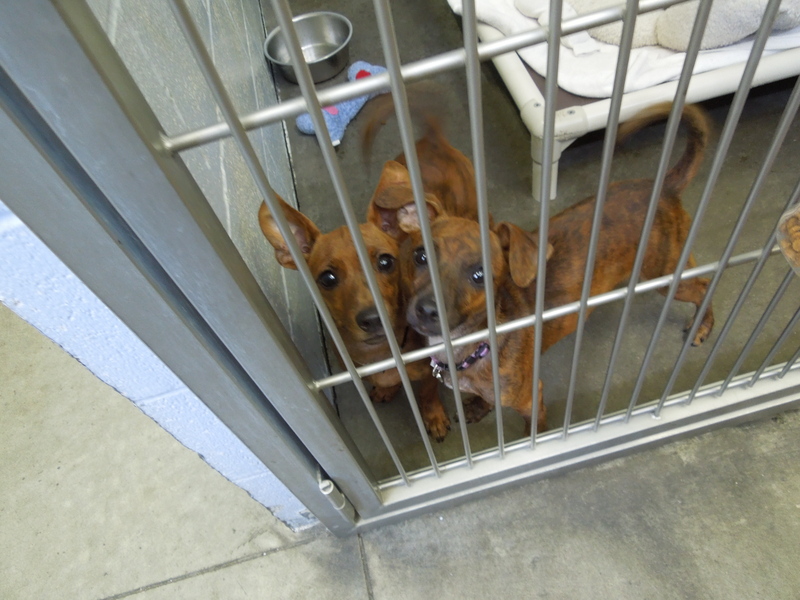 These are Brandon and McKay, six and four months, respectively. 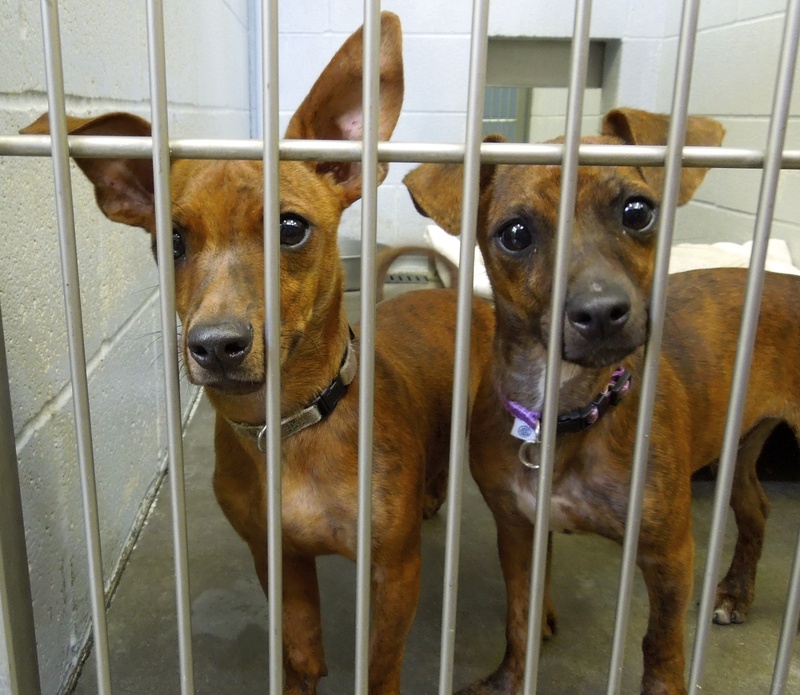 They are Terrier/Chihuahua mixes. They are as cute as buttons. 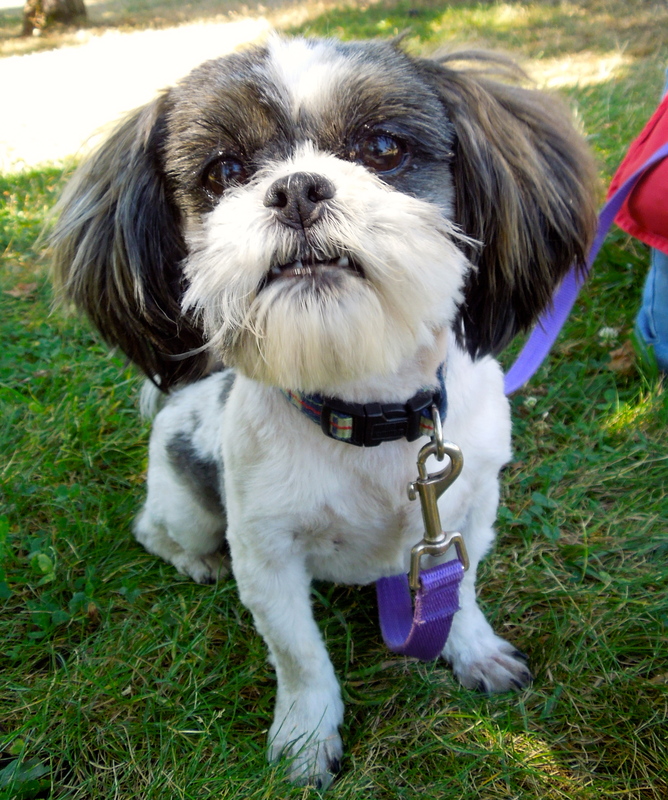 Miffy is a seven-year-old Shih Tzu mix whom I first met last week when she arrived looking like this. Today I was excited to see her out with Kathy sporting a totally new stylish look! 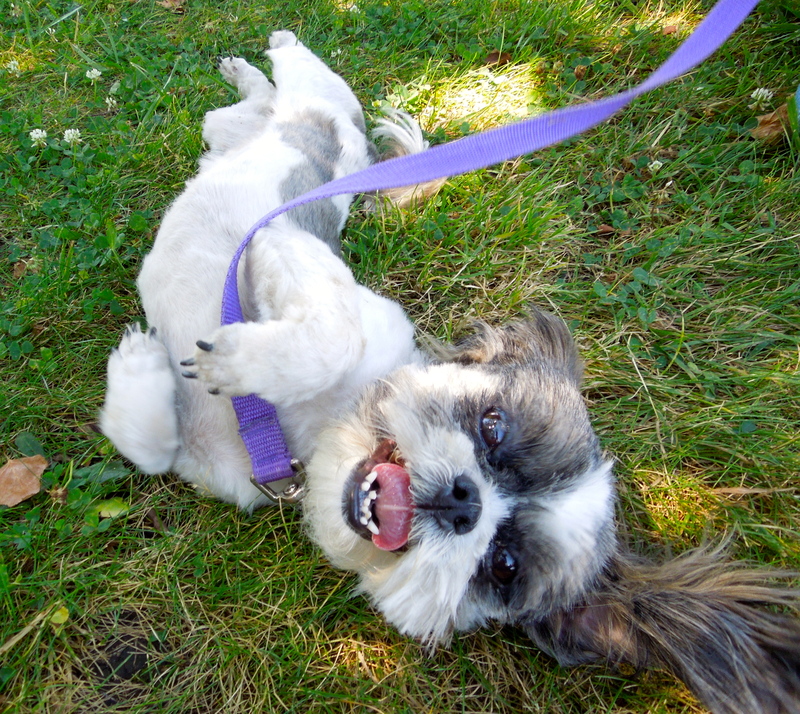 Miffy is a comical little character who is looking for a relaxed home. She will keep a new family in stitches, I’m sure, just like she did Kathy. I’ve been here a long time and I’m getting stressed. 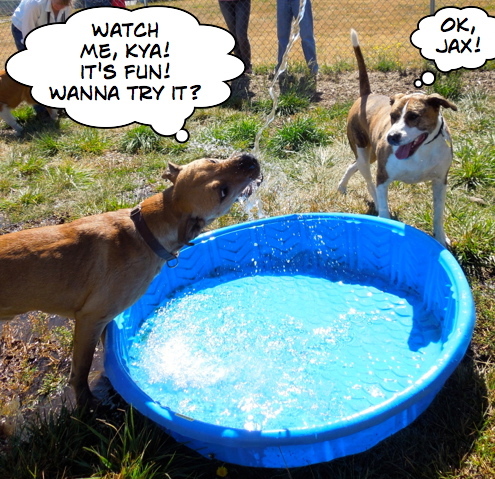 I have featured Jax several times in previous posts. He has been at WHS since mid-June. 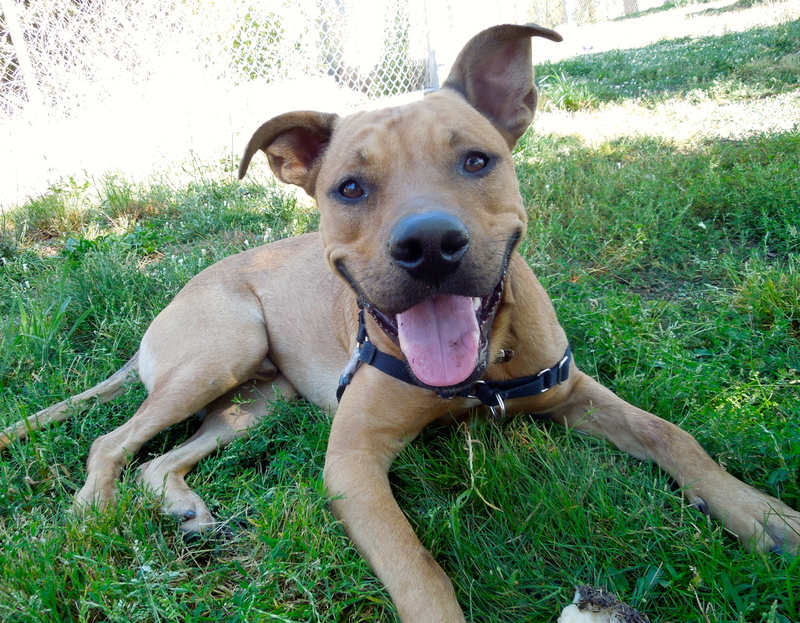 Although he is a friendly, active, one-year-old Pit Bull Terrier mix who loves to romp with the other dogs in play group, he has terrible kennel presentation. He barks at other dogs going by and does not at all appear the terrific dog that he is. Because of his poor manners inside his kennel, he is located in the stray section which means potential adopters don’t see him as they walk through the adoption kennels. His picture and information are posted in the hallway, he is on the website, and I try to promote him, but he has not gotten a lot of exposure. I’m so hoping that the perfect family will see him on the website or here and want to meet him in person. While Jax is active (he’s barely past the puppy stage and would be a super jogging or hiking partner), he can also settle down nicely. 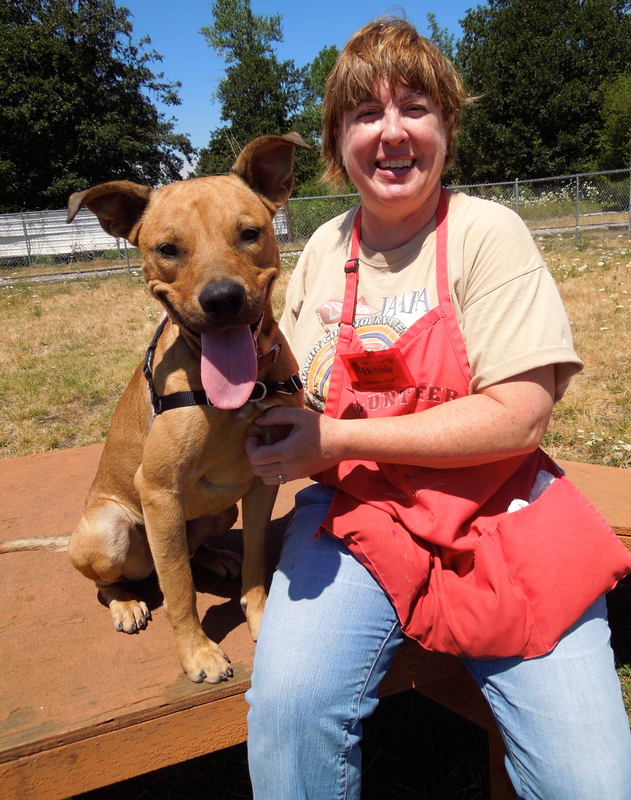 Here he is with volunteer Debbie out in the yard today. 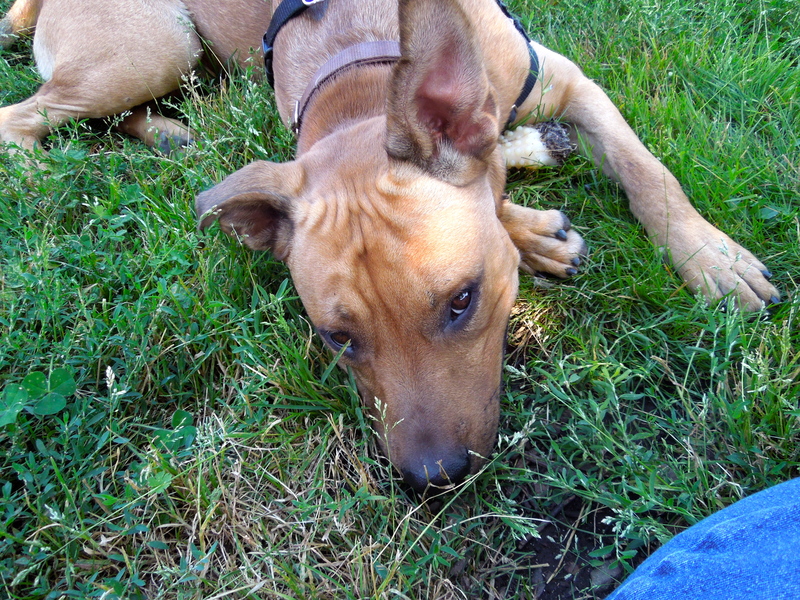 Later, after all the dogs had been out, I spent a long time in a yard with Jax just relaxing on the shady grass. He loved it. He enjoyed just sitting with me and I petted him and scratched behind his ears and on his stomach, as he chewed on a Nylabone and listened to me talking to him. 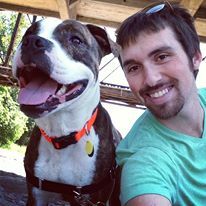 Jax is a very special dog and I’m hoping that the right person will read this or see him on the website and make the effort to meet him. They won’t be sorry. Emelynn’s Pick of the Week! When I asked Emelynn who was going to be her pick this week, I was secretly hoping it would be Pony. To my delight it was! I had been wishing for Pony because he has seemed so sad lately. On Sunday when I was walking through the kennels, he was lying on his bed and didn’t even get up to greet me. 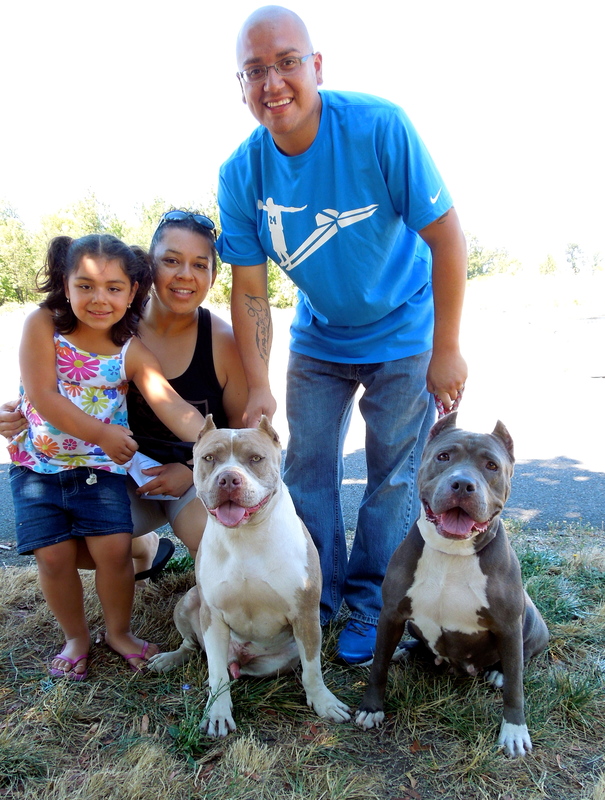 He has been waiting for a new family since June 6. 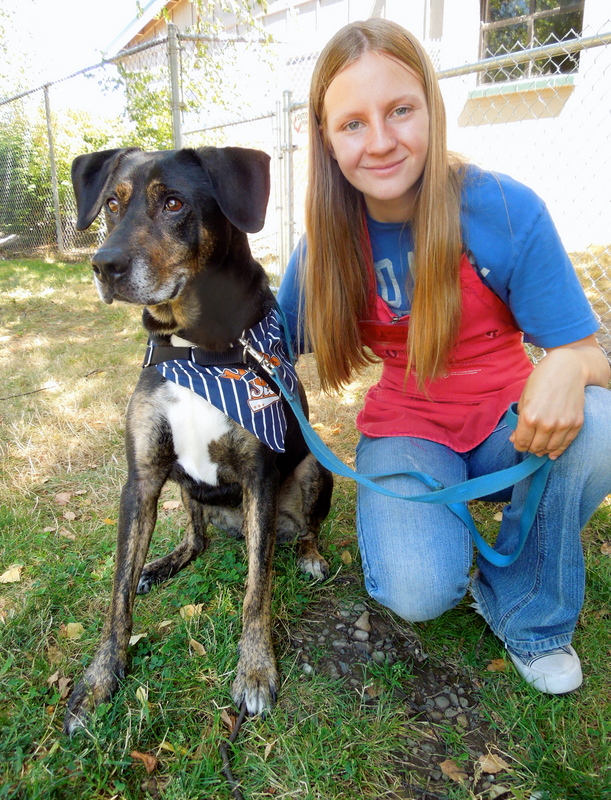 He is a seven-year-old Pointer/Hound mix. He walks well on leash and is gentle in taking treats. He is quiet in his kennel, which may be why people walk by without really seeing him. We’re hoping he’ll be adopted soon. He has very expressive eyes. Emelynn and I aren’t his only fans. 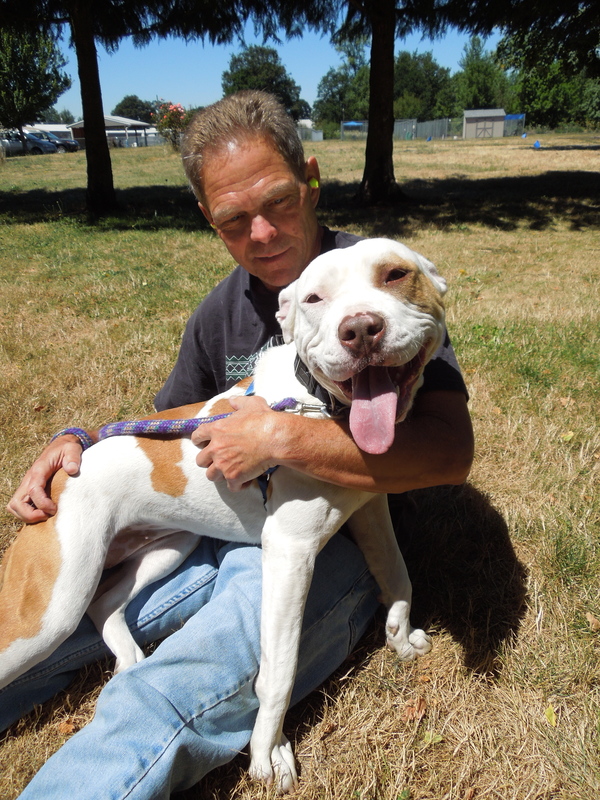 Volunteer Steve loves him, too, and spent extra time with him today. I’m a ball dog, I love to hike and jog, too. You need me! 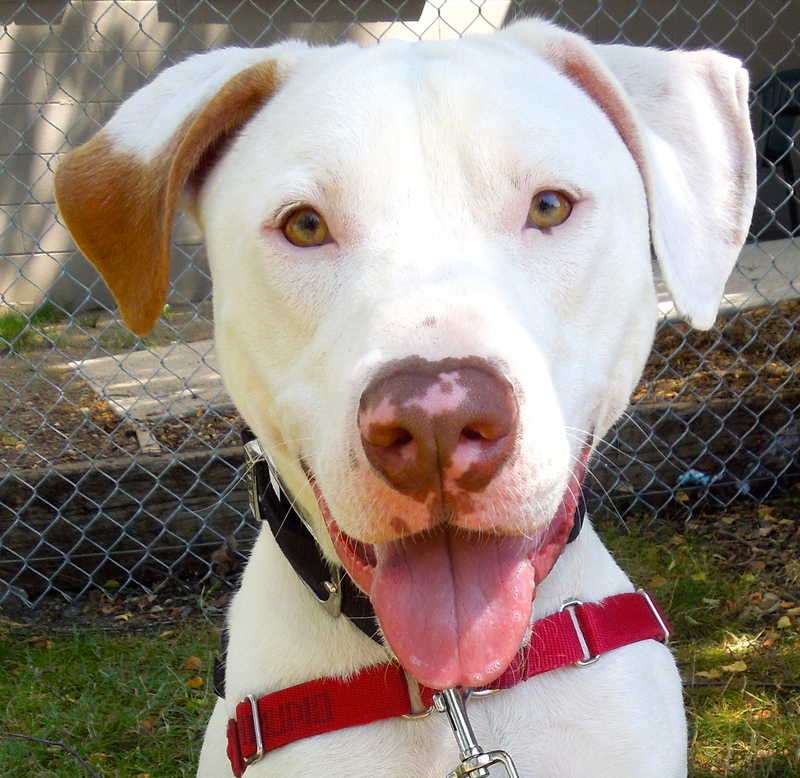 This is Viking, a one-year-old American Pit Bull Terrier/Great Dane mix. 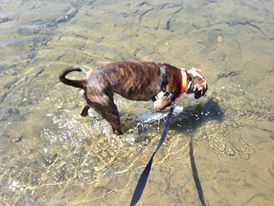 He is a fun, energetic dog looking for an active family who wants someone to have adventures with. 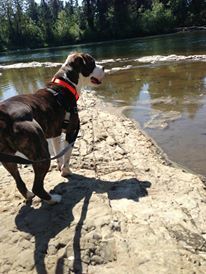 Viking would make a great hiking, camping and jogging partner. 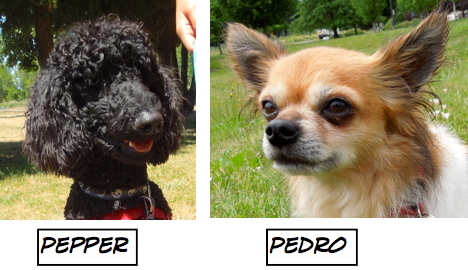 He would also do very well in one of our training classes to polish his manners. 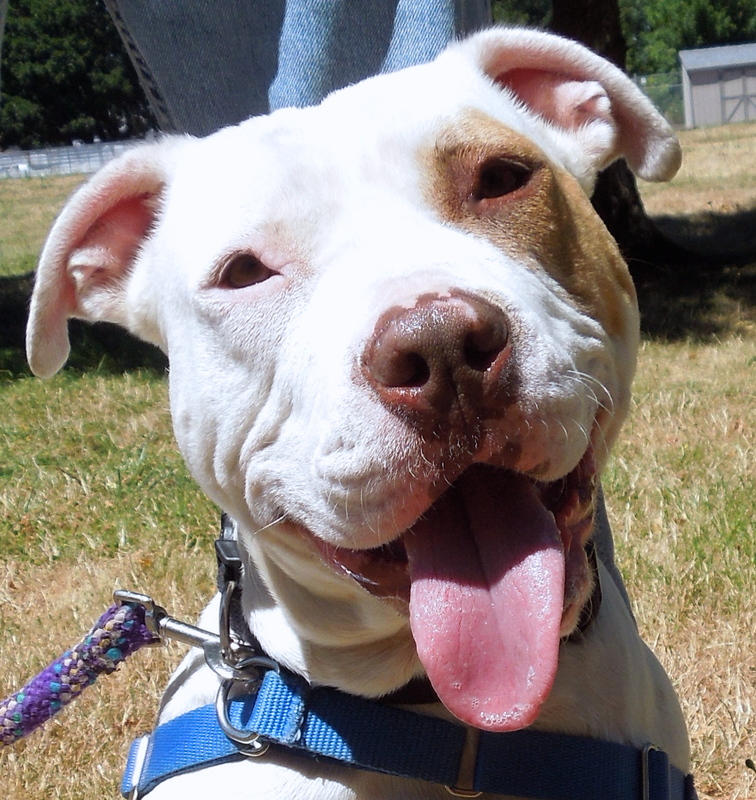 He’s a good young dog with lots of potential to be a great friend. 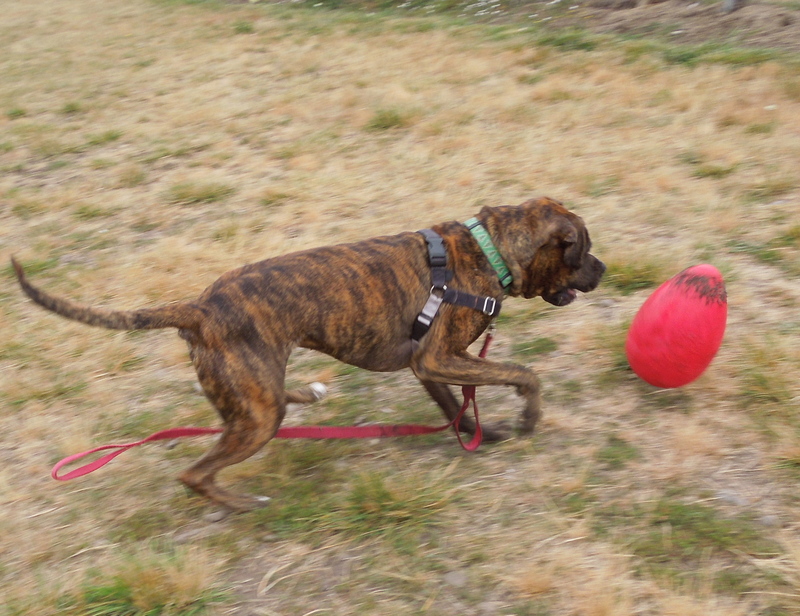 Joan had a lot of fun playing ball with him today. I’m actually a lap dog. Really! 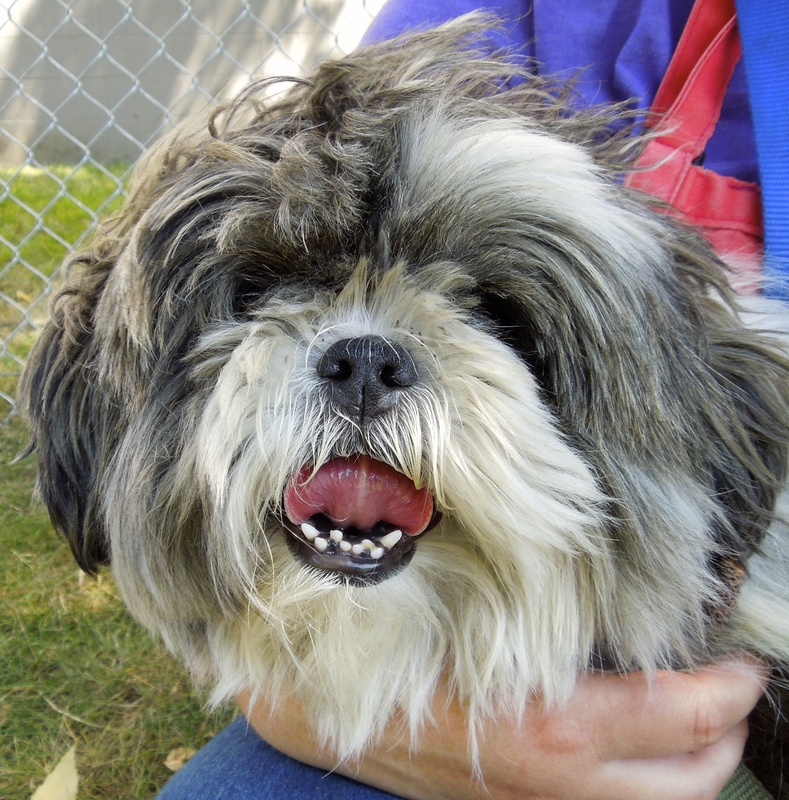 Mia is a new arrival and has instantly become a favorite of many. 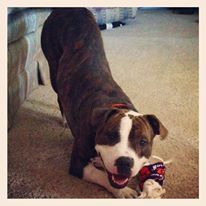 She is a one-year-old Pit Bull Terrier mix who has lived with other dogs and young kids very well. She has lots of energy, but at heart she is a snuggler. As I tried to get pictures for her profile today, she kept trying to crawl into my lap. Here she is with Joan. She’ll be a wonderful family dog. My name is Montana. I’ll be a great friend of yours! 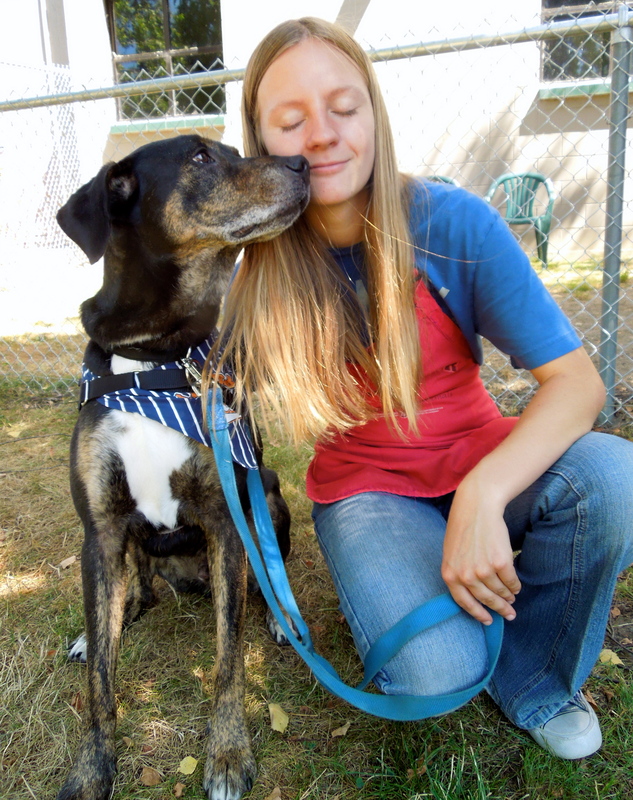 Montana is a one-year-old Pit Bull Terrier/German Shorthaired Pointer mix. He is very friendly and had a great time in play group. 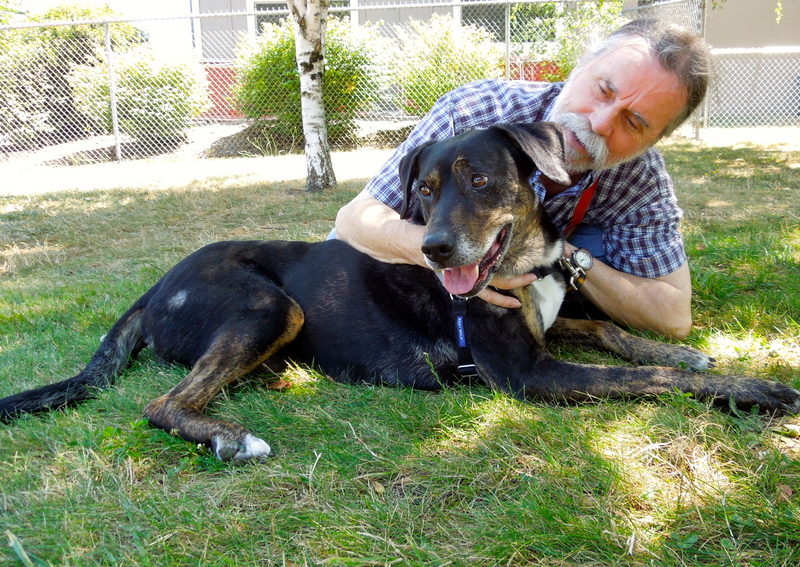 He has lived with children and is hoping for new people to call his own. 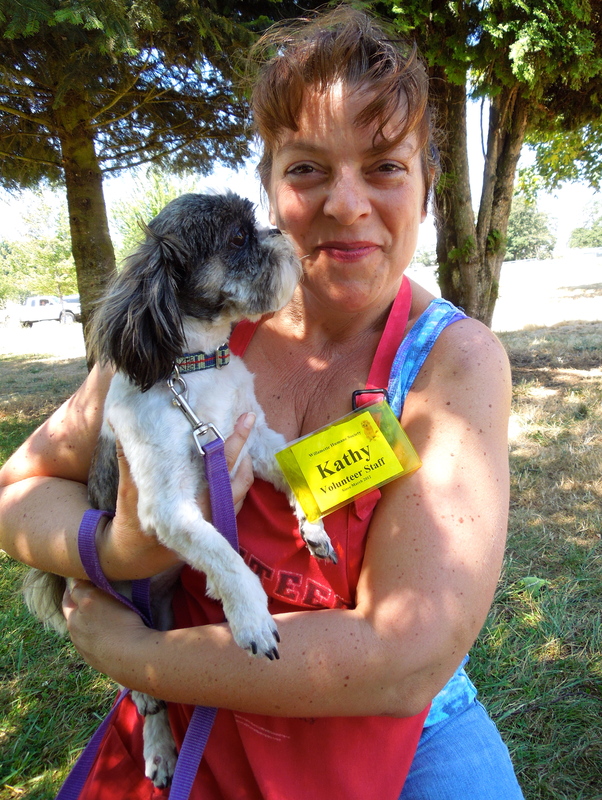 Here he is with volunteer Cindy today. 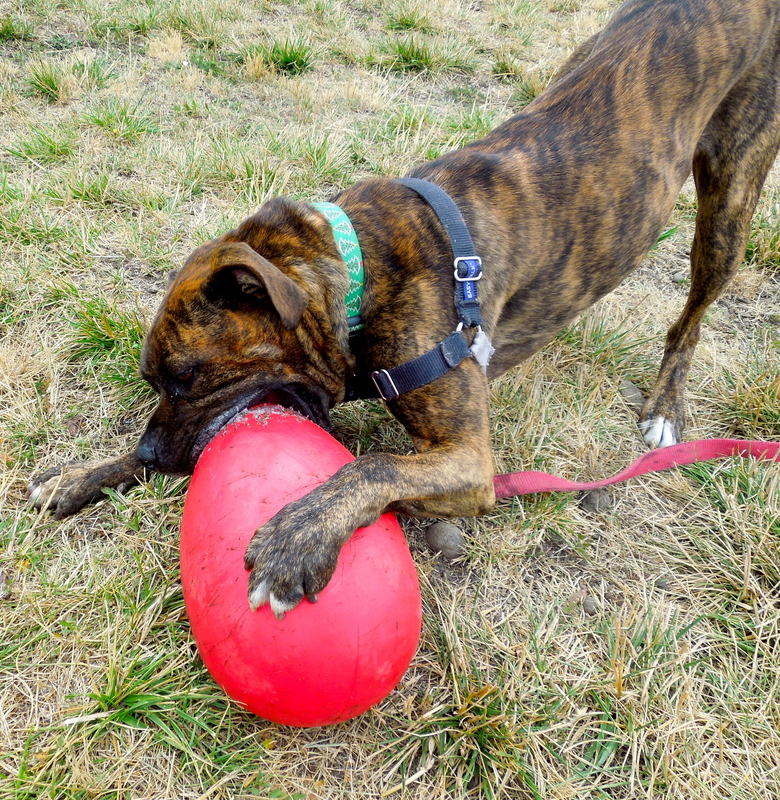 Yep, Axel (a two-year-old Boxer mix), is still waiting for his perfect match and in the meantime he has found a new favorite, did I say FAVORITE toy? 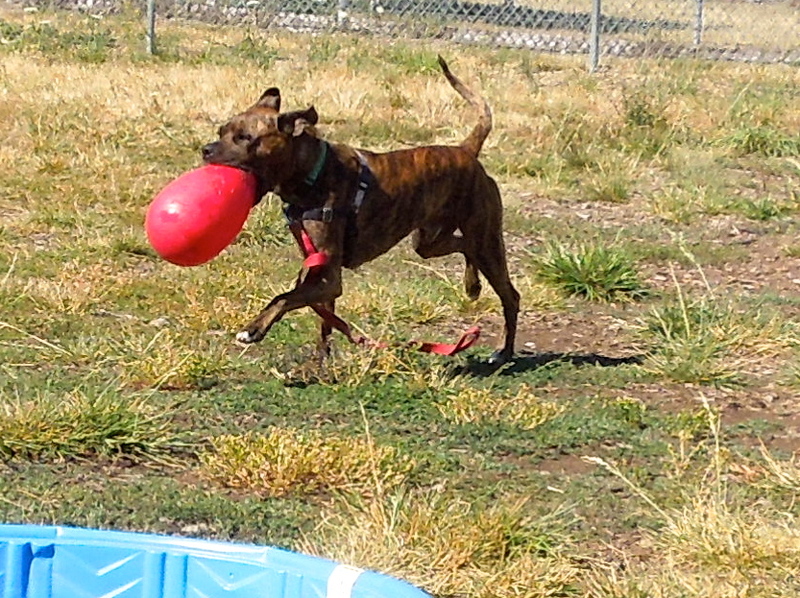 He LOVES his big red egg-shaped ball. 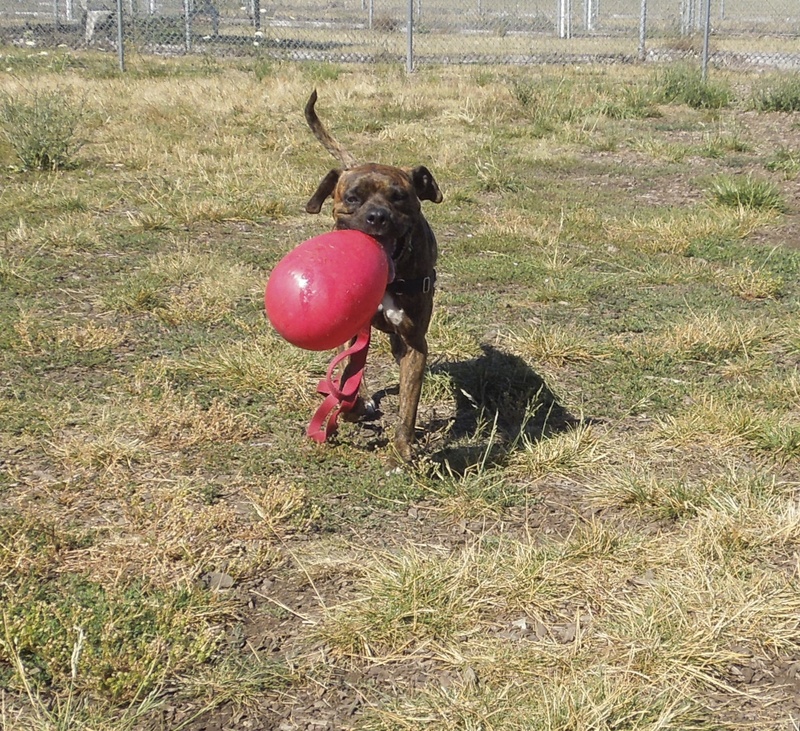 He paws it across the yard, and although it took awhile, he has managed to figure out how to pick it up and carry it around triumphantly. 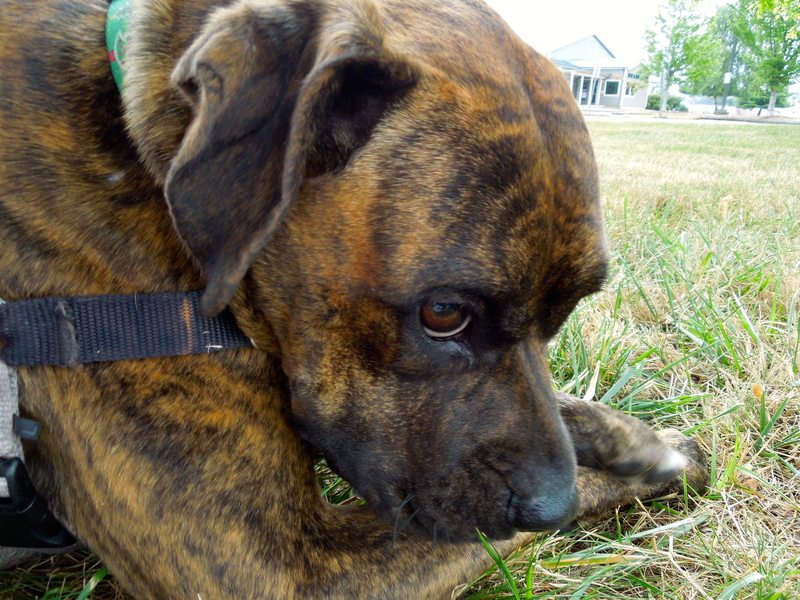 He will madly push it around, then pick it up, bring it back to where I’m sitting and flop down in the grass with it. All the time I’m laughing at him. 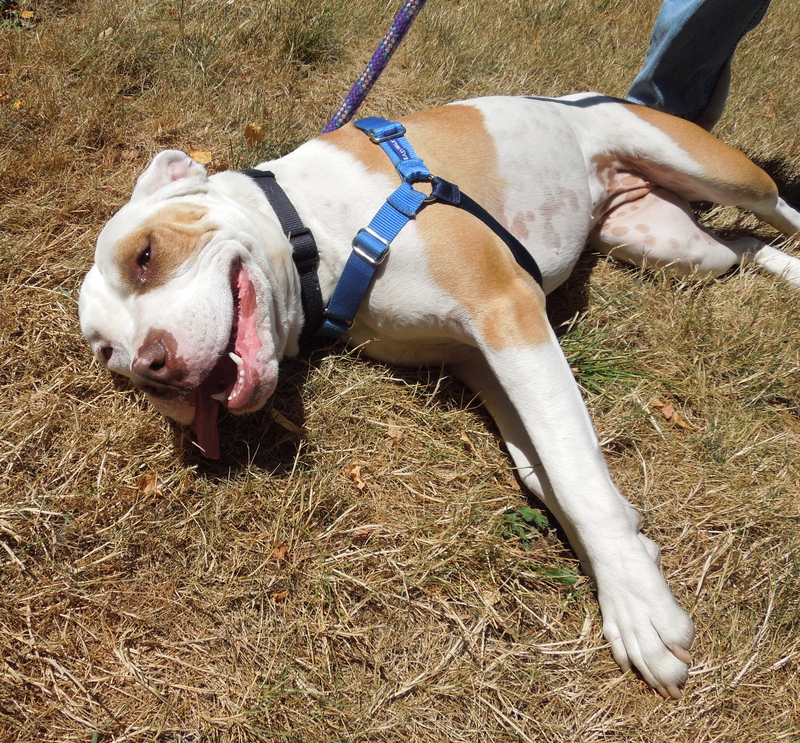 Whoever finally adopts this silly dog will never tire of watching his antics. And after the wild game, I love to sit with him in the grass and relax. I was so excited when Adam sent me an update after Remi’s first day in his new home! Here is Adam’s report and pictures. What a lucky dog! 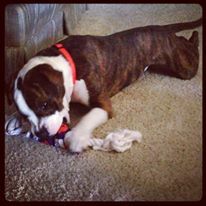 “Update on Remi aka Beefy. He is now home with me. We went for an hour walk then he got in the pool with me and loved the water… Came in for a snack and nap now he just had a bath and is currently on my nice clean bed sound asleep… He is a ham and I’m already in love with the little stinker.. Thank you all so much. Also one more thing… I watched the video of Axel and he is a sweet boy… Thanks a million. Love it!!! Thank you for featuring Jax! 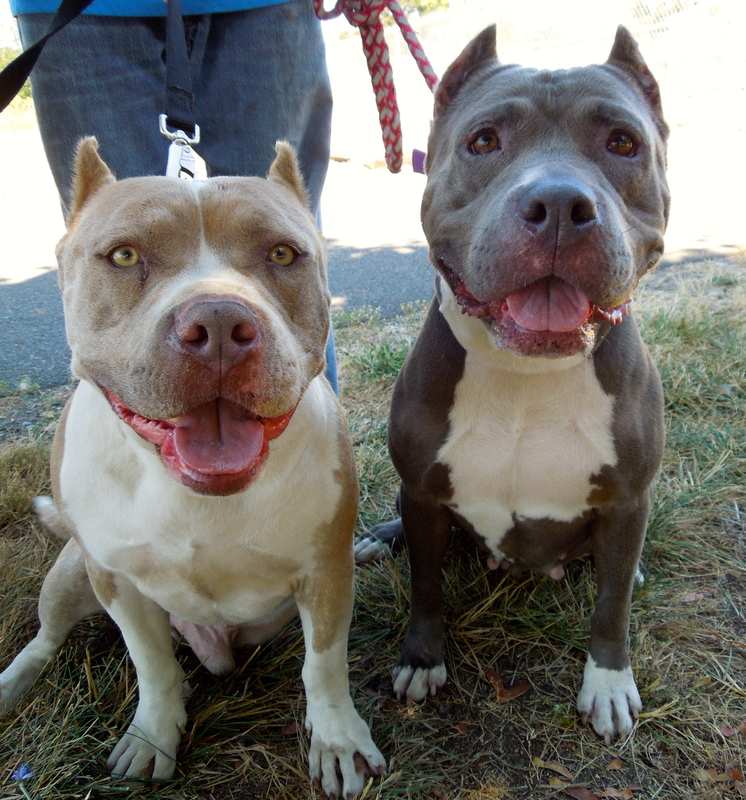 You have made me fall in love with pit bulls! Magic is absolutely adorable. My family was able to adopt Magic today! We did rename her Nala. I so appreciate the concern the staff had when we introduced Nala to our four year old chihuahua Bubba. Once bubba was able to say hello on at her house, everything was ok. They Are on the way to becoming napping buds. 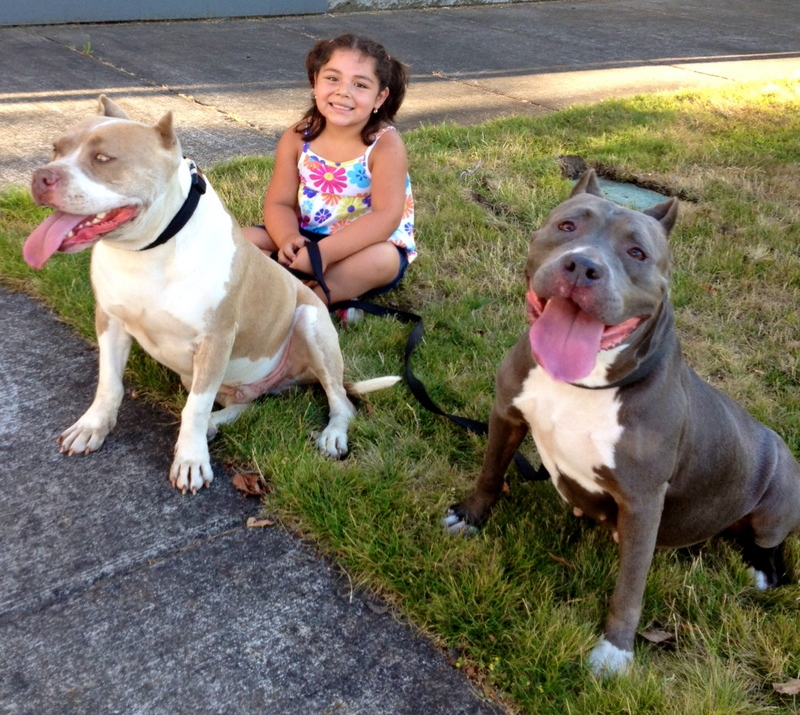 Nala wandered around the yard and enjoyed some playtime with our sons and bubba. She is a fabulous little girl. I look forward to many years of having this little girl with our family. Funny thing is we still have not heard her bark!?! Maybe it’s broken? Thank you for the wonderful work all of you do there at WHS. Hi Sam! Thank you so much for your comment! Magic/Nala wasn’t at WHS long, but she sure did touch a lot of people, including me! I’m thrilled that she has such a great new home! Could you PLEASE send me an update with a couple of pictures in a few weeks. 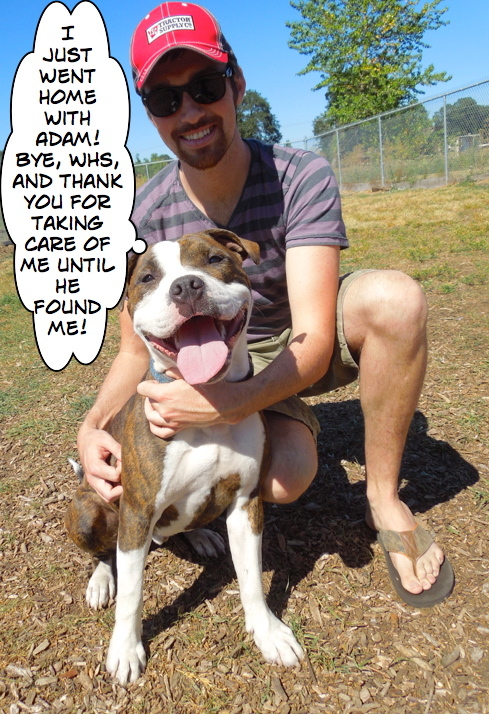 All of us at WHS love to get updates on the dogs we have loved. 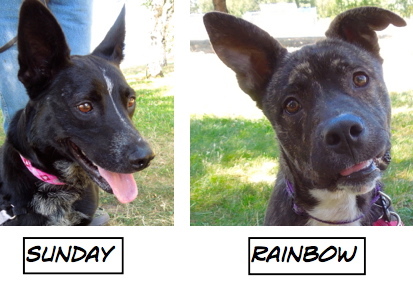 You can email the pictures and update to me at: adoptanoregondog14@yahoo.com. Thank you again for writing! Glad you featured Jax. He just needs some training. I took him out today and last week. If we wait till he stops barking to leash him up, and don’t reward him for jumping, he can learn it doesn’t pay to bark or jump. 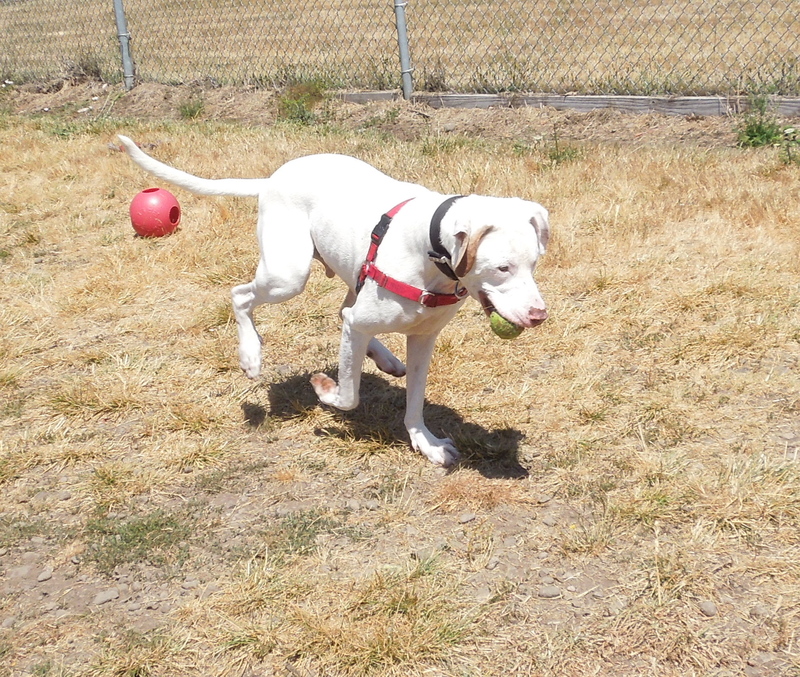 Outside he is affectionate and fetches, bringing the ball back. He likes to be petted, and didn’t bark at all outside, even left in an outside run for a few hours, with dogs walking back inside nearby. Wish I could adopt him, but already have 2 dogs. 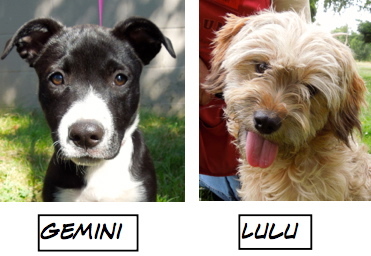 Loved the happy endings of successful adoptions with their new “people”. Want to get a notice when a new post is published?